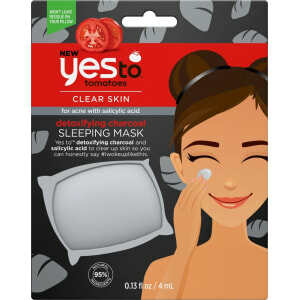 Yes to Tomatoes Charcoal Acne-Fighting Sleeping Mask - .13oz from Target. t absorbs easily and leaves skin feeling soft, smooth and clear of those pesky pimples. Use it alone or after our other Yes To single use masks. Don't worry, the mask won't transfer to your pillow, but it will leave your skin looking gorgeous. Gender: Female.